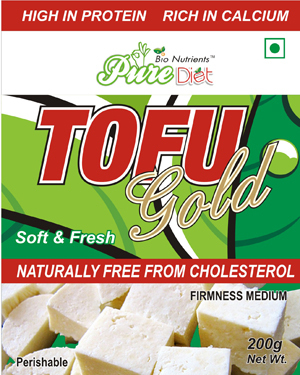 Bio Nutrients (india) Pvt Ltd. is proud to introduce pure Diet ” Tofu Gold”. Naturally packed with protein,calcium and anti-oxidants,”Tofu Gold” is an excellent way to add nutrition to your diet. Naturally packed with protein,calcium and anti-oxidants,”Tofu Gold” is an excellent way to add nutrition to your diet. Tofu Gold is made from Soy Milk Powder which eliminates the beany flavor. Special food grade Calcium salts as coagulants prevent the pungent smell or sour taste. An additional benefit of Tofu is that it is extremely easy to digest, because the Fibre is removed during the manufacturing process. Cooking with Tofu is not difficult. Tofu in Breakfast: Scramble or Sorted. Tofu in Salads and Soups: Marinated, Dips, Cubes. Tofu in Vegetables: Replacement to paneer in all Indian preparations. Tofu in Chinese and Thai cuisine: Authentic. All the good news about Tofu Gold being a health-promoting food is true. Tofu and Women’s Health: Postmenupausal oesteoporosis. Tofu and Men’s Health: Improved bone density. Minerals: Calcium, Manganese, Selenium, Phosphorous, Iron, Copper, Magnesium, Zinc.